VEHO MUVI K-SERIES K-2 PRO 4K WI-FI HANDSFREE CAMERA ACTIONCAM WITH LCD. Capture 4k ultra high-resolution videos and shoot 12MP photos with the Muvi K-Series K-2 Pro Wi-Fi handsfree camera from Veho. The Muvi K-2 Pro is the latest camera from the Muvi K-Series range and features the new super powerful XA-9 Hercules chipset, improving the performance of the Muvi K-2 Pro compared to its predecessor the XA-7 Achilles used on the previous K-2 models. Capture ultra high-resolution 4k or 2.7k video with amazing quality and clarity. The K-2 Pro also allows you to film in full high-definition at 1080p at 60fps or 720p at 120fps, perfect for slow-motion play back. For photos the Muvi K-2 Pro captures high quality 12MP resolution photos and has a selection of photo modes for you to capture images the way you choose, including time lapse, high speed photo burst and 180 rollover mode. The built-in G-sensor auto-start will set your Muvi K-2 Pro to start recording on a change of gravity. Included in Muvi K-2 Pro bundle is the new Muvi K-Series smart LCD touch screen that features a better and clearer display, allowing you to frame your shot, preview videos, photos and navigate the menu to change settings and preferences with ease. The large 1500mAh interchangeable lith-ion smart battery ensures that your K-Series stays charged for up to 3 hours of recording time, which makes it one of the largest batteries on the handsfree camera market. Just like the Muvi K-2 Sport, your Muvi K-2 Pro comes with a rugged protective carry case, so you can transport and store your camera and its accessories safely whilst on your travels. 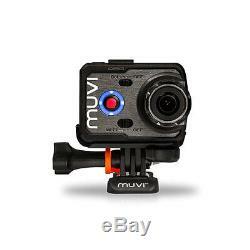 The Muvi K-2 Pro also ships with other accessories such as tripod mounts, flat & curved 3M adhesive pads, CMOS lens protector, lanyard and decals. Super powerful XA-9 Hercules chipset improving the performance of the Muvi K-2 Pro compared to its predecessor XA-7 Achilles. Smart LCD touch screen to preview videos and photos and to easily navigate the menu to change settings and preferences. Built-in Wi-Fi on the Muvi K-2 Pro allows you to record, live view and share your content on social media using the free Muvi K-Series smartphone App. Muvi K-Series K-2 Pro Camera, Rugged Carry Case, Silicone Case, Muvi K-Series Smart LCD Touch Screen, 1500mAh, Removable Battery, K-Series Tripod Mount, CMOS Protector, Curved 3M Mount. Total Digital Stores is the UK's fastest growing internet reseller of brand name consumer electronics, gadgets and tech accessories. Customer service is at the heart of our business. We pride ourselves on guaranteeing our customers quality and genuine goods with fast dispatch times and excellent customer service. Our business philosophy is simple - giving the customer what they want, fast and at a great price. Please note that this is not a guaranteed service and can take longer during busy/seasonal periods. It is then Argos' responsibility to inform you once your parcel has arrived and is ready for collection. If you wish to do so. We aim to respond to your message within 24-hours (weekdays). Please include your name , invoice/order number and any additional information that could help in speeding up this process. Haven't receieved your item? It is recommended you take proof of ID with your name and address clearly labelled with you to your local sorting office. This will allow you to send the incorrect item back to us hassle free and completely free of charge. The correct item will then be dispatched to you, dependent on stock availability. Please note this happens on very rare occasions through errors on our automated packing system. If you deem your goods to be faulty on arrival , please return the item back to us for appraisal by our in-house technicians. We do not accept items back that are customer damaged , e. Water damaged, snapped, customer repaired (sellotape/glue) or generally tampered with. The item "VEHO MUVI K-SERIES K-2 PRO 4K WI-FI HANDSFREE CAMERA ACTIONCAM WITH LCD" is in sale since Friday, April 28, 2017. This item is in the category "Cameras & Photography\Camcorders". The seller is "totaldigitalstores" and is located in Cheshire. This item can be shipped to United Kingdom, Austria, Belgium, Bulgaria, Croatia, Cyprus, Czech republic, Denmark, Estonia, Finland, France, Germany, Greece, Hungary, Ireland, Italy, Latvia, Lithuania, Luxembourg, Malta, Netherlands, Poland, Portugal, Romania, Slovakia, Slovenia, Spain, Sweden, Australia, Canada, Brazil, Japan, New Zealand, Israel, Hong Kong, Norway, Singapore, South Korea, Switzerland, Thailand, Chile, Mexico, Bangladesh, Bermuda, Bolivia, Barbados, Brunei darussalam, Cayman islands, Ecuador, Egypt, Guernsey, Gibraltar, Guadeloupe, French guiana, Iceland, Jersey, Jordan, Cambodia, Liechtenstein, Sri lanka, Macao, Monaco, Maldives, Martinique, Nicaragua, Oman, Pakistan, Peru, Paraguay, Reunion, Saudi arabia, South africa, United arab emirates, Ukraine.